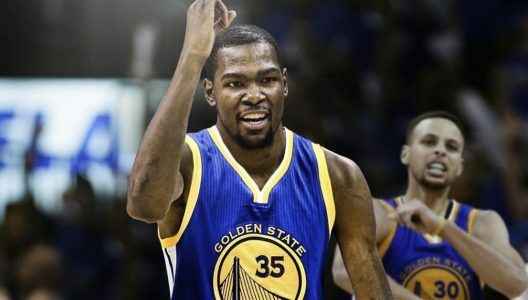 The Golden State Warriors will host the Oklahoma City Thunder at Oracle Arena Wednesday night. Golden State opened as a 12.5-point favorite with the total set at 226 points. The game will tip off at 10:30 PM EST and is to be televised on ESPN, FSN Oklahoma, and CSN Bay Area. The Golden State Warriors head into the game with the best record in the NBA at 35-6. In their last meeting on Nov. 3, the Warriors destroyed the 25-18 Thunder 122-96 as a 12-point favorite here at Oracle Arena. Kevin Durant showed no mercy to his former team as he led the Dubs with 39 points while the Thunder’s Russell Westbrook was held to 20 points on 4-of-15 shooting from the field. The home team is 17-5-1 ATS in the last 23 meetings in the series and the Warriors have covered the spread in each of the last four. Under is 7-1 in the last eight meetings here in the Bay Area while four of the last five overall have stayed under the total. The Thunder have dropped two of their last three games, failing to cover the spread in each of the defeats. Oklahoma City is in the midst of a six-game road trip, and the team took a big beating by another top team in the West on Monday when they lost 120-98 at LA Clippers. That was however the second game of a back-to-back set, and the Thunder should do better here as they’re 10-2 ATS in their last 12 games following a straight up loss of more than 10 points. Russell Westbrook should be pretty fresh after logging just 29 minutes against the Clippers. OKC is ranked 10th in the NBA averaging 106.5 points per game, but the Thunder are struggling with shooting from behind the arc making just 32.6% of their attempts (29th) and their free throw shooting could be better as well ranking only 27th in the league. One of the Thunder’s strengths is their play under the basket, as they rank in the top 5 for both offensive and defensive rebounding. The Thunder are 13-3-1 ATS in their last 17 after allowing 100 points or more in their previous game while the over is 7-3 in their last 10 after allowing 100 points or more in their previous game. The Warriors have won eight of their last nine games outright, and they’re coming off an emphatic 126-91 win against last year’s champions Cleveland Cavaliers. They owned the game from start to finish and held the Cavs to 35.6 percent shooting from the field while outscoring them 37-13 on fast break points. The Warriors were 15-of-34 (44.1%) from 3-point range, and they’re third in the league shooting 38.4 percent from behind the arc on the season. They could run into some trouble here though with the Thunder pretty good at defending the perimeter. Golden State is ranked 1st in the NBA scoring 117.7 points per game, but the Warriors are not quite as efficient on the defensive end conceding 105.1 points per game on average. Defensive rebounding is a bit of a weakness as they allow 43.5 per game, 17th in the league. The Warriors are 8-1-1 ATS in their last 10 games after scoring more than 125 points in their previous game but just 2-6 ATS in their last eight games overall. How much gas is left in the tank after that slaughter of the Cavs? Under is 14-6 in Warriors last 20 overall and 7-2 in their last nine games following a straight up win of more than 10 points.